Discussion in 'Transfer Forum' started by bbest, Dec 2, 2007. 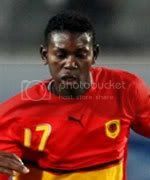 Petro Luanda star Manucho has been invited for a trial with English Premier League side Manchester United, according to Angop news agency. The state-run broadcaster claims that Manucho flew out to Old Trafford on Tuesday to commence a spell of training with the Red Devils, with a possible view to a longer move. The striker managed 16 goals in Angola's top division, the Girabola, in the last campaign, which ended in November. This was added to his previous total of 15 for the 2006 season. Since the current season is over, the Luanda-based Petro outfit have not been deprived of one of their top players, but with the versatile attacker also set to take part in the African Cup of Nations in January, it is thought that his trial will end long before January. Only one Angolan, Jordao of West Bromwich Albion's 2002/03 season, has played in the Premier League so far. Never heard of him...is he good? could be a good signing if he comes good!! He has had some good ones lately, lets hope this is another. Doesn't even exist on FM. yes, if he can score goals then he might score goals. We're only interested in bringing him over to sell more shirts in Angola..
We should sign the Angolan stiker who played in the last WC. The one who tried overhead kicks all the time. He's class! Uncle Glazer will be making tons of money from there, eh? have a day off son.. It's no secret United need another striker. Don't know much about this Angolan striker. Anybody mind giving some information about this totally unknown guy?? In fact he is nearly as good as Dong. that would be ironic. he'd probably be a bad signing if he turned out bad too. Another Portuguese speaker eh? Is Ronaldo's house going to turn into a bed and breakfast? k14, you've obviously seen this chap in action, would you say he's the new Etoo, new Ronaldinho or new Zlatan??? He's the African Dong. Possibly called Wang. Angola's Football National Team coach, Oliveira Gonçalves, expressed his optimism about a positive result of a test Petro de Luanda's player Manucho Gonçalves will do to join England's first league team Manchester United, ANGOP has learnt. Speaking to the press, the coach considered that the striker has enough quality to joining Manchester, although there are good players in that squad. In his opinion, Manucho Gonçalves, the best scorer of the latest edition of the national first division football championship with 15 goals, should now be playing in a more competitive championship, in order to improve his performance. Manucho is since Tuesday in England to test in Mancherster United, the local champions. They'd make a great duo. "Dong and the Angolan" Sounds like a mafia-duo, that. I think his name was Akwa. Manucho looks a bit like Eto'o in that picture.